In 1966, an American B52 bomber was flying over the coast of Spain. Refueling in midair was still a somewhat new procedure and so when a KC-135 tanker tried to connect with the B52, there was a collision. The tanker exploded in midair and the B52 fell apart. None of the tanker crew survived, but 4 of 7 B52 members could jump out and use their parachute. Unfortunately for the people of Spain, the B52 packed four Mk28-type hydrogen bombs. Three crashed on land and 1 in the ocean near the tiny village Palomares. 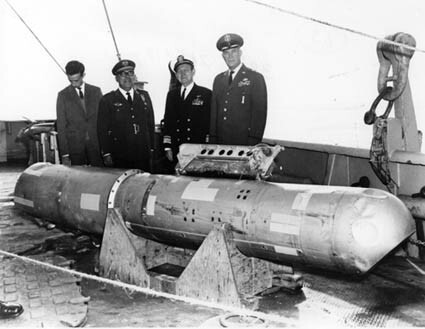 The US Navy reacted by bringing in dozens of ships and 5000 troops to search and recover the bombs. The people of Palomares and adjacent towns were not allowed to go out for several days. Eventually, it was found out that some radiation leaked because 2 of the bombs conventional explosives detonated. There was (and still is) some radioactivity due to this incident, but luckily for the Spaniards the hydrogen bombs safeties worked well. The bombs were recovered and sent home to the US. The Spanish government was not amused. They officially announced that the US military may no longer fly over Spain with nuclear weapons.